So we’re T-minus 7 days until our first show, and my last two rides on Derby have not been good at all. He’s been very resistant, not wanting to bend, and not wanting to go forward. Christy has had me work on the response to my leg, both in terms of lateral response to calf pressure, and forward response. Both are marginally better but still not fantastic, though with a lot of work last night, I was doing trot/canter/trot transitions on a circle pretty easily – meaning that I didn’t have to ask emphatically, and that Derby’s response was swift. However, the real resistance is to rounding. He’s going around braced against the reins, with the muscles on the underside of his neck bulging. He will round and soften momentarily when I really get busy with my inside leg, but then he pops right back into bracing. Christy and I discussed this resistance at length after my lesson. I had gone over his back before and after, and there was no soreness either before and after the ride. So what’s going on? Derby is generally a pretty uncomplicated horse, and is pretty willing. I recalled how we had a terrible ride last weekend when I tried a thicker pad that combined fleece and memory foam. I had no go button and lots of resistance. I went back to my usual fleece half pad, and had two nice rides on Monday and Tuesday. 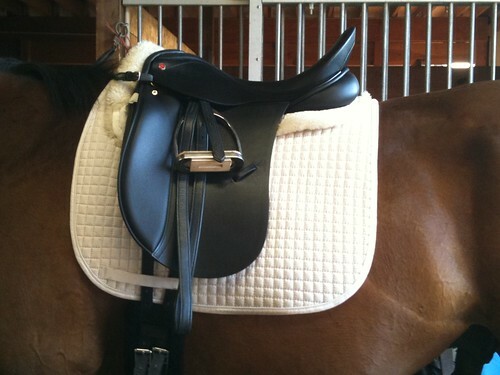 I’m going to remove the fleece pad for my ride on Saturday, and will go with just a saddle pad. Hopefully this simple equipment change will solve the issue! As soon as we caught our breath from the show, Christy and I started to zero in on the (myriad) problems in my ride. One glaring issue really popped out – my posture. In almost every moment, I was tipped forward, with a closed hip angle and my lower leg creeping back. So we started working on my position, which isn’t fun. Fundamentally changing how you ride is tough. It feels awful. You feel out of whack and it’s tough to be effective. It’s no fun but having reaped the benefits of this sort of work last winter on Maddie I know that the payoff is worth it, even though it feels like you’re riding like total crap for a while. The work started in my first lesson post-show. Christy had me work on finding my balance in my new saddle, starting with asking me to stand in my stirrups. I stood, briefly, then teetered and collapsed. Stood again, swayed, grabbed the bucking strap, and collapsed. We played with my leg position, but it was clear that that I wasn’t going to be able to balance myself with my legs behind my knee blocks. With my legs wedged behind the blocks, I was pushing against them, and they were acting as a fulcrum, causing me to tip my upper body forward, and my lower leg aft. So we started over. Christy had me lift my knees up – waaay up – to isolate my seatbones. Once I was sitting properly on my seatbones, she had me bring my legs softly down, draping them over the blocks, in order to keep my hip angle open. She asked me to stand again, and I was able to stand more steadily in my stirrups. We picked up the trot, focusing still on finding and keeping my balance. It was a struggle but eventually I was able to find the ‘sweet spot’ and suddenly, it felt like I was floating above the horse. Derby responded, rounding his back and striding out. The value of riding in balance was undeniable. On subsequent rides, I worked through my mental checklist, starting with my seatbones, and working on finding my balance, which frankly didn’t get much easier. I was able to bring myself into alignment for brief moments, but I’d rapidly lose it and start over. In my heart of hearts, I realized an ugly truth. The Albion’s balance isn’t great for me. It’s very comfortable, cushy even. But the balance is off, and the deep seat and grippy leather make it tough for me to move. Today, when I was running errands, I wandered into the local tack shop and poked around amonst the used saddles, surfacing with an ancient Barnesby all-purpose similar to that pictured at the top of the page. It was in lovely shape despite its years, with a shallow seat and teeny-tiny blocks. The seat and flaps were hard and slick. In other words, it was the polar opposite from the Albion. After a quick consult with the saddler’s apprentice, who pulled Derby’s wither tracings and confirmed that the narrow Barnsby was potentially a decent fit, I tucked the saddle under my arm, doubled back to my house for a longer girth, and headed to the barn. The saddle did indeed look like it fit Derby pretty well, so I tacked up and got on. It felt pretty good – hard and slippery – but balanced and solid. I stood in my stirrups to test that aspect of the balance. And I stood easily. This was a good sign. I had a decent ride but this saddle will definitely take some getting used to. I do like how flat and non-restrictive it is, enabling me to move and find the right position, versus holding me in one spot. I believe the saddle fit woes that kept us grounded are finally over – the new Albion K2 Genesis that arrived last week is working well for both Derby and me – so far. From my perspective, the saddle is extraordinarily comfortable and well balanced – it accommodates my long femur and my decided preference for a closer contact feel and a narrow twist. Derby seems to like it too – he’s relaxed and isn’t showing any resistance. His back soreness is almost gone. The saddle’s arrival coincided with a week of brutally high temperatures, with heat indices of well over 100 for the week. While it wasn’t pleasant, it didn’t impact my riding. I was planning on doing light rides with Derby at the outset, just 20 minutes or so, mostly walking – and that’s what we did. We stepped it up to 30 minutes with more trotting yesterday. 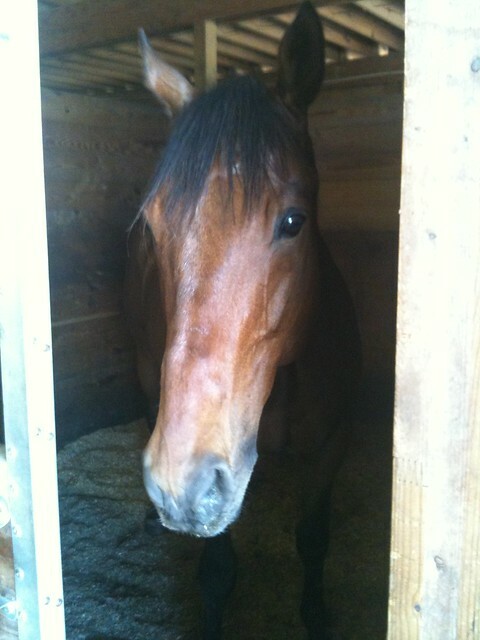 We’re not working on much at all at the moment – getting the horse back into condition to support real work is job one. I’m starting to ask for some stretching and transitions, and am doing so incrementally. In other news, some bad habits are back in force – namely, the toes-out, knees-out position I fought to overcome on Maddie last winter. Because I’m still not working too hard with Derby, I’m picking up rides on other horses so I can sustain my own efforts longer. Lots of two-point work is ahead of me. And I have to work on stretching my hip flexors – so I can roll my whole leg inward. Ugh. Back to square one! A riddle wrapped in an enigma, slathered in mud. For the last week my interactions with Derby have been on the ground – my saddle doesn’t fit him well, and he started to get a little sore after I rode him for a short duration, despite using a slightly wider gullet that looked better balanced on him. As I noted earlier, he started to get a little resistant shortly into our ride – light on the front end and unwilling to move forward freely – signs, in my experience, that the saddle is uncomfortable. However, after the ride his back wasn’t sore. The next day, however, was a different story – Derby started to show what I’d call mild soreness. I was out of town in the middle of last week, and I asked Christy to do some training rides on Derby, if his back recovered. However, on Tuesday he was very sore, and Wednesday he wasn’t much better. On Friday, Christy went over him more thoroughly, and discovered that Derby was also very sore in his left hind muscles. Horses are like dominoes. One thing can affect many others. Atlanta is a good example of this – she was very back sore a while ago, when she was due for hock injections and had some shoeing issues on her hind feet. Now that she’s had her hocks done and the shoeing problem has ben addressed, she’s going beautifully, and her back feels good. (She sure used it in the training ride she had with Christy last week!) Christy suggested that something else was going on – that one short ride in a less-than-ideal saddle could cause this much persistent soreness – such as a slip in the mud or torquing something during turnout. I put him on the longe line today to see how he moved. Moving to the left, he looked fine, stretching while he trotted, moving out willingly and tracking up. He stepped neatly into a canter when I asked. Everything looked good. It was a different story going to the right, however. He was short behind and didn’t stretch while trotting. When I asked him to canter, he swapped leads behind. We stopped. I hadn’t been giving him any bute, because I wanted to gauge the recovery of his back. And tonight, after we stopped longing, his back looked pretty good, but his hiney was still pretty sore. I gave him a couple grams of bute, and after discussing it with Christy, decided that a short ride tomorrow – mostly at the walk, and focusing on stretching, would be the plan. I have a Schleese saddle on trial that looks like it fits him pretty well. We’re going to do gentle “horse yoga” – bending, stretching and giving – but I won’t be engaging his hind legs. We’ll just work on straight lines and big loops. 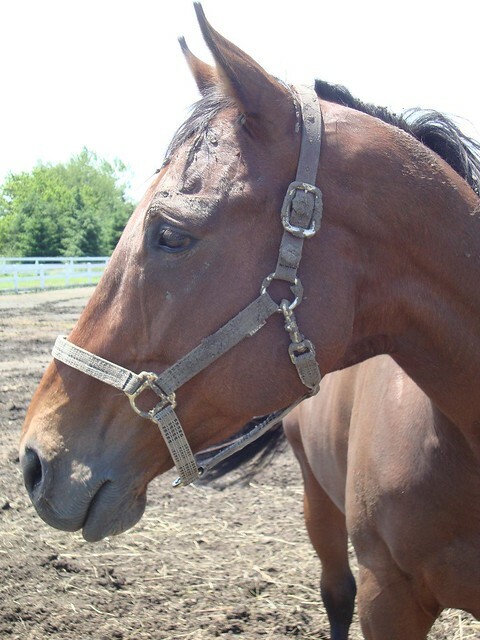 Hopefully, he’ll recover in a few days – our saddle fitting is tentatively scheduled for the 16th. Hopefully I’ll have a saddle I can ride confidently in soon. I continued to mess with my saddles, pads and shims in an effort to cobble something together that would work for Derby until Kate Lamacki, a Master Saddler (one of four in the US) and Qualified Saddle Fitter can work us into her schedule. When I tried the Wintec with a medium narrow gullet, the saddle was pommel high. On Sunday, I switched to a medium gullet, which looked a hair wide, and added ultra ThinLine shims to my Mattes pad. The balance looked OK, the wither clearance was fine, it didn’t feel like it was pinching. I rode Derby for about 20 minutes, when he started to feel resistant – he was unwilling to go forward, and was starting to toss his head. I promptly dismounted. Despite the short ride, the clean white saddle pad didn’t reveal anything in the sweatmarks – it was hot, and Derby was pretty dirty. The pad was one big smear of sweat, fly spray and dust. I didn’t see any dry spots on his back, and I poked and prodded for soreness, but didn’t find anything. However, on Monday night, Christy palpated Derby’s back, and found a couple spots that were a bit sore, which was no surprise, given what transpired under saddle the night before. There was no way I was going to compound the situation by riding, so we spent the evening exploring the farm, and grazing with Liz and Cloud. So we’re grounded until we meet with Kate, and (hopefully) find a new saddle that fits us perfectly. I’ve had Derby for just a few days, but the more time I spend with him, the more I like him. He’s proving to be sweet, gentle, willing and sensible – just what I was seeking. He’s also a quick study. His first walk through the back aisle of the barn when it was empty elicited some snorty looking around. The same trip today? Nothin’ but a thang. He’s an easy horse to be around and work with – and I’m really enjoying him. Yesterday was really hot, and I was pressed for time, so I didn’t ride, principally because I needed to try a couple different saddles, which would take a little extra time. So instead of riding, I decided to do a short session on the longe line. I’ve spent a fair amount of time longing different horses, and have had some real a-ha moments. There was one break through session free-longing Jag in which we were so in synch that I was able to guide him around the arena – over poles (something he always avoided if he could), changing directions and gaits. What made that night so cool was Jag’s unwavering focus on me. He read and responded to my every move and cue. Maddie and I had some interesting moments too. She was not as tuned-in to humans, was more easily distracted, and I had to work hard to gain and keep her attention. She also would constantly test me – which at its heart is a respect issue, since longing is more about using your position to influence the horse and get the outcome you seek. She and I did have some good moments – I used longing to gain her attention when she was wound up and uncooperative more than once. And shortly before she went to her new home, I was able to work her at liberty, getting her to canter serpentines all down the arena. Longing is interesting to me, because I think it lets you evaluate how responsive and attentive the horse is. Derby turned out to be a star. The barn was almost empty, and most of the other horses were outside. I put Derby on the longe line, and went into the arena. Initially he was a bit tense, and immediately stepped off into a trot. I stepped toward his shoulder and said “walk,” and he did. We did some transitions in all three gaits, and worked a bit on standing still, in both directions. Derby was attentive, responding to a quiet verbal command or shift in my stance. We cooled out, and I led him into the indoor wash stall, to continue introducing him to all areas of the barn. After a quick rinse off, we hung out and grazed for a while. Today I had more time, and went out with my newly-adjusted Wintec Isabell and a cool old Stubben Romanus. I tried the Stubben first but hopped off almost immediately because my stirrups were too short. I ride with extra long leathers, and past experience with this saddle has suggested that standard leathers would work. The last time I rode in it, I ended up having to wrap my leathers, because the shortest hole wasn’t short enough. Every saddle is different, and they ride differently on different horses. However, today, the wrapped leathers were too short, probably because Derby has such a deep girth. I had to get off to unwrap the leathers. I hopped back on. I love the Romanus but unfortunately, in about 1 minute I determined it doesn’t leave enough wither clearance on Derby. Rats. I hopped back off and we went back into the barn to try the Isabell. I put in a wider gullet, and am using my Mattes pad with a Thinline shim in the front. It was better than the medium-narrow, and we had a good (and uneventful) ride but I don’t think it’s a perfect fit. I’m scheduling a saddle fitter for next week. I think the new pony will need a new saddle, too. This isn’t entirely unexpected. There’s always a period of adjustment with new horse. We’ll get there. 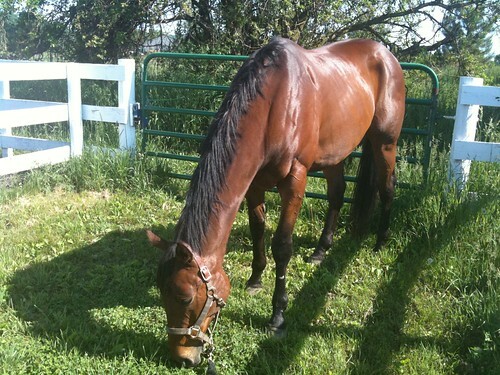 A shiny Derby chills after today's multiple saddle changes and subsequent ride.